​The history of towing in one form or another has been around probably since the dawn of man - ever since man needed to move some form of mass larger than themselves. For many of those earlier years, it was manpower itself that did the hauling and unfortunately, many of those times it was the power of slaves and forced labor that did all the grunt work. Then came the invention of the wheel, which helped ease the process of transporting a great deal. Continuing down the road of history many thousands of years and we arrive to the age of the combustion engine and its incredible power and endless uses. The landscape of mankind has forever been drastically changed by this invention and its multitude of possibilities. There are many forms of towing, from down on the farm with a tractor pulling debris and trees preparing and cultivating the land, to tug boats on the water navigating massive ships and barges through specific channels. Another form we don’t often think about is that of aircraft, which can often be seen towing gliders in many forms and fashions. 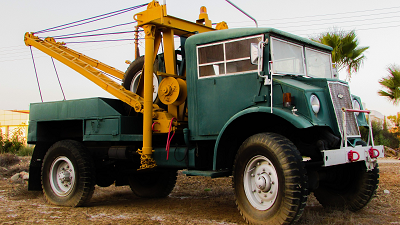 The most common form of towing that the general population often associates with the term is that of a tow truck for personal cars and trucks. The evolution of these machines has advanced right along with the research and advancements of the combustion engine over the last 100 years. Today, the industry uses a couple forms of trucks, each with different sizes depending on the size of the item being towed, i.e., buses and semis versus a car or truck. There are the flatbed truck styles with winches to pull the complete vehicle up onto the bed of the truck. Or you have boom hitch style that lifts up one end of the car, pulling it on either its back or front two wheels. Most individuals come across the need for a tow truck during a breakdown or accident and the request comes voluntarily. Though frustrated by the incident, the tow truck is a welcomed sight and solution to their problems. Other times the need for such a truck is involuntary by the person but is needed by either businesses or government agencies when a vehicle has illegally parked somewhere or has been abandoned. This can often lead to a vehicle being impounded and locked up until some form of payment is made to retain ownership of the vehicle. A vehicle lender or some form of legal action may also be taken to produce the need for the vehicle to be repossessed, a form of towing that usually doesn’t like to be talked about much and brings with it a negative connotation about the “repo” man. However, this is a real need in society in order to properly manage the assets of a company or financial institution. Justice has to be served even it looks a little ugly and can often create confrontational situations. Many other needs and situations are often met through some form of towing. Long distances to travel will bring the need to figure out how to properly haul a vehicle without damaging it or producing too much wear and tear. Vacationers with RVs often pull a smaller vehicle behind them, which understanding the mechanics of each car and what can and cannot be done is essential. This goes for moving as well and figuring out how to haul or tow vehicles behind a moving truck, though many moving companies provide guidance and instructions on what can be done for the specific type of vehicle someone has. Towing Butte MT is a well needed business and a consistent industry as more people acquire more vehicles, become mobile and travel a lot more in our society. Companies range from a one man show working out of his own garage, to massive businesses with many employees and drivers in many locations to serve the public. Dispatchers are an industry in and of itself as they frantically take calls and organize the fleet in an artistic flow of efficiency. Some companies have entire dispatching centers and advanced technology to orchestrate the daily chaos into a smooth performance. From large to small companies, cities to small farming communities, towing in all its shapes and forms will always be an essential part of our modern life. Big or small, the job needs to get done.